You don’t really need a scientific explanation of how solar energy works to enjoy the benefits of a solar energy system. It’s not necessary to know that PV (photovoltaic) cells contain two layers of semiconductor material composed of silicon crystals in order to reduce your energy costs. Most people don’t know that impurities are deliberately added to those crystals to increase their conductivity, and that this process is called “doping”, just like in sports. Even if you had no idea that the bottom layer of a PV cell is doped with boron to facilitate a positive charge, and the bottom layer is doped with phosphorus to facilitate a negative charge, just knowing that solar energy is good for the environment is enough. Most people enjoy learning about how things work. However, our brains only have so much storage space and scientists are making new discoveries every day. It could take a lifetime to learn every detail of even a process as simple as photosynthesis. Even though the science of increasing the effectiveness of solar cells and systems can be complicated, creating and using solar energy is a simple three-step process. Solar cells collect and transform sunlight into DC electricity. Solar panels are composed of a number of solar cells connected together. A solar array is composed of a number of solar panels connected together. The total number of solar cells in a solar energy system determines how much electricity it can generate. Each solar cell contains both positively and negatively charged semiconductors, which create an electrical field. Solar cells are lined with conductive metal plates. When energy from sunlight is absorbed in the form of photons, that electrical field forces electrons to flow towards the metal plates. That flow is an electrical energy current. The current is then directed into wires as DC (direct current) electricity. 2. DC electricity is converted to AC (alternating current) with an inverter for use in powering homes, offices and appliances. An inverter is an essential part of solar energy systems. The energy generated by the solar panel flows through wires to the inverter. Once the electricity has been transformed from DC to AC, the inverter sends it to an electrical panel, also known as a breaker box. That panel distributes it to various locations within a household or business. Three of the most common types of inverters are string, central, and micro. String inverters are good for installations with panels facing the same direction. Central inverters are larger and can support more panels. Micro-inverters are installed on each panel and convert DC to AC right in the panel, which means that one low-performing panel doesn’t affect the performance of other panels. 3. The amount of electricity generated is measured by a meter. Solar energy systems that are connected to the grid use a bi-directional meter. When energy generated by the system is used, the meter moves forward. Energy generated by the system that isn’t used goes back into the grid, the meter moves backward. This process is called net metering, and utility companies credit you for excess energy your solar energy system generates. Your rooftop solar panels supply your needs first, then contributes to meeting the needs of your local community. Many people are now purchasing solar batteries that can store excess generated energy for later use. As the price of those batteries continues to decline, their use is expected to increase. One of the biggest benefits individual solar energy systems provide to the grid is producing electricity when and where it is most needed. For example, sunlight produces the most energy just when air conditioners are most likely to be working overtime. Another important characteristic of solar energy systems is their ability to provide increased resilience to all types of disasters, both natural and man-made. Other types of traditional power plants are more likely to fail when part of a system is damaged. Large-scale solar energy projects have the solar cell advantage, in that even if one part of a system is damaged, the other parts can still continue working. 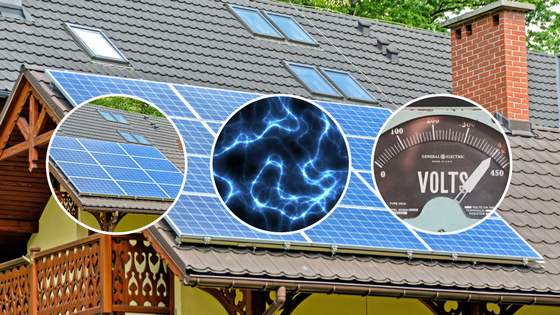 Solar energy systems utilize the knowledge gained from many branches of science: chemistry, physics, meteorology, and geography are just a few of them. While most of us aren’t scientific experts, we can all benefit from their discoveries. Luckily, we non-experts have the privilege of learning as much, or as little, about how things work as we want to. However, we no longer have the privilege of ignoring the conclusions of scientific experts, and one of those conclusions is that transitioning to clean energy is essential for preserving our planet. Our future depends on it.